Oxebridge Quality Resources’ founder and the author of Eyesore 9000 and Surviving ISO 9001:2015, Christopher Paris, presents snarky but informative guide on implementing the latest aerospace quality management system standard without breaking the bank or crashing any airplanes. 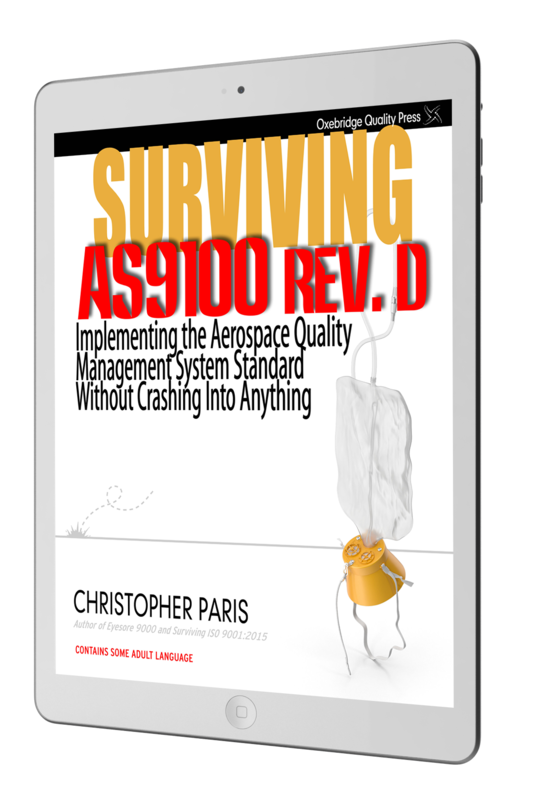 Surviving AS9100 provides proven, real-world implementation advice based on Mr. Paris’ decades of work in the aerospace field for companies such as SpaceX, Northrup Grumman and NASA, but presented in his unapologetically humorous, and sometimes off-color, manner. Surviving AS9100 Rev. D will be available in e-book format only, readable on your Kindle or similar e-reader or tablet, or via free e-reader software for Mac or PC. Pre-Order Now at only $35, and receive a notification for download when the book is completed and published. This is a Pre-Order Offer Only! The final retail edition price will be higher, and the Pre-Order Edition includes extra material that will not be included in the final Retail Edition! (C) 2018 Oxebridge Quality Resources International LLC. All rights reserved.